Stocking everything but the loofah! Bathe is a youthful and forward thinking supplier of Modern, Stylish, Affordable Bathroom & Stoves, based in Mid-Ulster, Northern Ireland. Stocking a vast range of material from all the leading manufacturers in showers, toilets, wash basins, taps and more as you will see in our products, as well as all relevant accessories. Simply put, Bathe is a one-stop shop for all your bathroom & Stove requirements. 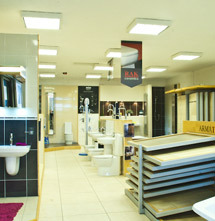 Don't hesitate to call today for a free consultation or to simply browse our newly refurbished showroom. In addition to the very latest in Bath wares, we are located adjacent to the The Tile Shed™, which many of our clients find extremely convenient. If you require an ‘out of working hours’ appointment, don't hesitate to contact us today; we will endeavour to arrange a meeting at a time that suits you best.